Folding this reminded me of my fascination with whales - one of my dreams is to watch a whale leap out of the ocean and crash back in, at (relatively) close range. That would be like an encounter with a god of the seas. This 25cm x 25cm kami came from Daiso at $2 a pack, and I don't think I'll use it much more. The paper isn't exactly square, and heavily creased areas are prone to tear and shed color. Dissatisfied with the result, I found some leftover elephanthide at home in roughly the right color, and made what I hope is a better version. However, the color change was lost, and some details (like the pleats in the lower jaw and general body shape) had to be sculpted by wet-folding. At the OUSA 2011 Convention I learned to fold Daniel Robinson's Humpback Whale, and i loved it so much that I folded it many times during the flight back home. I guess I love whales too much. Step 15 of the diagrams shaped the upper jaw of the whale using a curved depression, quite standard. Daniel Robinson's whale used that too, but its lower jaw closes from the outside of the upper jaw, whereas the lower jaw of Lafosse & Alexander's whale sprouts from within the upper jaw. This causes the latter whale's lower jaw to appear trapped behind the curved depression. I didn't like that, and strangely the sample whale photo attached to Lafosse & Alexander's whale diagrams used a sort of swivel fold instead of the curved depression. Eventually I copied their method in my grey rendition. The photos in the slideshow show a grey whale against a white background - what background color should I have used to hint at an aquatic environment? I tried a few blues, but they didn't mesh well with the grey subject. Beautiful. I just came back from a trip to Newfoundland. I didn't get the chance to witness these beautiful creatures and hold the same fascination and desire to see whales as you. I happened upon your blog looking for a way to fold a whale with the maps I used during my trip to honour and connect with them in a way that I have not yet been able to. 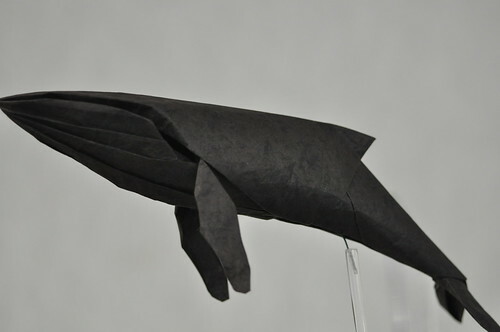 I'm glad you liked it - there are lots of ways to fold whales from simple to complex, but check out Origami Art by Lafosse and Alexander for the diagrams to fold the whales in my post! The book has diagrams for many other beautiful animals too.